She is afraid. Not because she is alone. Not because thick roiling clouds obscure the moon. Not because the wind rushes through the forest like a wild dragon. She is afraid because she is late. And to be late means death. Her life had been happy once. Despite the destruction wreaked by Tauscher, traitor to the King... Despite the distant war led by the Prince and fought with the help of her three brothers... Despite her own poorly-chosen nickname... Despite the absence of the luxuries she grew up with, Beauty enjoyed life. 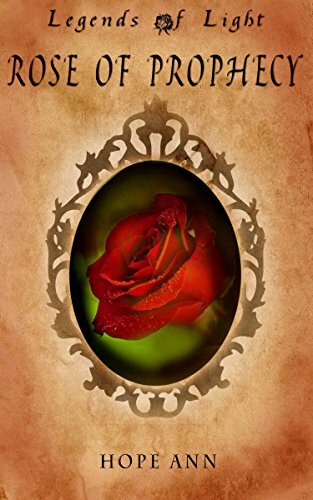 Of course, that was also before her father left home on a hopeful errand but returned weary and ill, bearing a velvety scarlet rose which he claimed would never wither. But even life in the ancient hall, tucked away in the center of Mosswood, surrounded by roses of every description, overshadowed with mystery and home to a scarred figure who was more beast than man, wasn't too bad after a time. But now...now, in a flash of light, Beauty finally glimpses the truth. And the cost. The price which must be paid, or the sacrifice which must be made. It is a curse which even love alone may not be able to break. This is going to be a tough one to review without spoilers ... but I'll try. First off, I think this book toyed with my expectations a bit ... or maybe my expectations toyed with me. The fairy tale retelling genre seems to be very dependent on "twists" and "new takes" and this is (at least at first) a very straightforward retelling of the original tale. It wasn't until near the end that the author introduced a few elements I hadn't seen before. However, the writing was dang good. Strong voice, really potent, nice mix of descriptions ... just good. I think that drew me in and kept me reading past when my jaded brain would otherwise have given up for "lack of novelty" (because I admit, as a reader, I'm very into the "shiny.") which might've been created by how closely this follows the original tale. The book isn't preachy. There is definitely an allegorical element that could've been preachy, but wasn't and it is overall a satisfying read I would recommend (definitely a short story rather than a full novel. Not a bad thing, in my book. I like short reads, but I know some people really like to spend days in a book, and this is an "afternoon" book, not a "days" book). My only beef: some elements of the allegory didn't work for me. It wasn't as clean and straight forward as say Narnia where "oh yeah, I get how this works with Aslan being a divine figure and also an "actively in the story figure." ... some of the allegorical elements felt like they needed more explanation for me (like how "magic" works generally in this world. If their King is literally a God figure is He immortal and all powerful or is He not exactly God just sort of an "image" of God that stands in for this world? Just little "world building" things I didn't get a sense of ... admittedly, a long explanation of how it works would probably be out of place in this short tale which kept a pretty decent pace and really never had a place to stop and "explain" itself).